A man was hospitalized Tuesday with multiple stab wounds he suffered when he was attacked by a group of men in Oceanside.Photo via OnScene.TV. A man was hospitalized Tuesday with multiple stab wounds he suffered when he was attacked by a group of men in Oceanside. 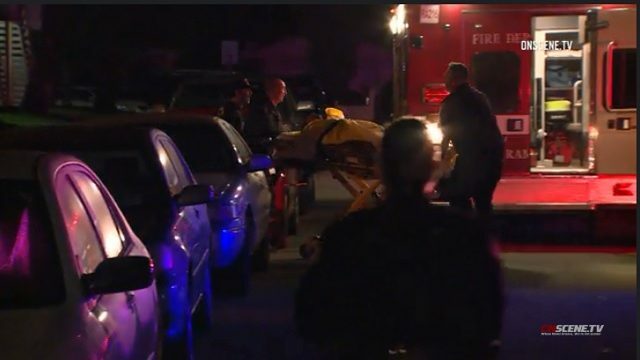 Dispatchers received a call shortly before 11:45 p.m. Monday from a person reporting a stabbing outside an apartment complex in the 4700 block of Calle Las Positas, Oceanside Police spokesman Tom Bussey said. Officers responded to the area and found a man with multiple stab wounds to his back and neck, Bussey said. The man was taken by helicopter to Scripps Memorial Hospital La Jolla, but he was expected to survive, Bussey said. Investigators believe the victim got into an argument with a group of five or six men for unknown reasons outside the apartment complex before the attack happened, Bussey said.